Breast Cancer Awareness holds a special place in my heart because I have watched those I love suffer from this disease. It is important that we raise awareness to the signs and symptoms. It is also important to have regular screenings because many are affected and don’t experience signs or symptoms until it is too late. Regular screening tests (along with follow-up tests and treatment if diagnosed) reduce your chance of dying from breast cancer. 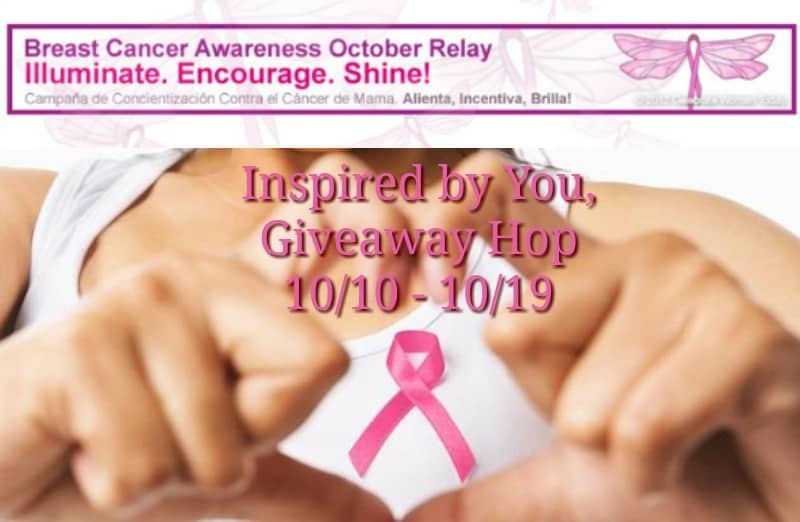 I have teamed up with a great group of bloggers for the Breast Cancer Giveaway Hop. Each blog has a unique prize for you to enter to win. Our prize comes from our friends over at The Paisley Hanger Boutique. One lucky winner will have a chance to win a CC Beanie (perfect for the cooler weather.) Enter to win our Breast Cancer Giveaway below and then hop on over to the other blogs for your chance to win even more great prizes. I pledge I will do monthly exams because I have had a scare before and am very cautious now. I pledge I will do monthly exams annual exam is always scheduled the day after my birthday. A friend has breast cancer so I know the importance of early detection. I pledge to have annual screenings as I have had breast cancer twice. Such a cute hat and it spreads a good message. I commented on the popcorn witch hands. such a great idea for Halloween! I like the Fall for You boots, in brown. They look fantastic for fall! I have always done annual checks to be proactive in keeping healthy. I really like their Oversized Blanket Scarf- Navy. Very pretty and I bet very warm! I pledge to do monthly exams my annual exam is always scheduled the day after my birthday so I never forget. I had aa Dr appointment today and my Dr reminded me because of breast cancer month. because i have kids! gotta stay healthy for them! Have hem done and will continue to do so – thanks. I love the Faith, Hope and Love Tee from The Paisley Hanger. I pledge to do monthly self exams and a yearly mammogram because I want to be around to watch my family grow up. I do pledge, but I’m a believer already. My sister is a breast cancer survivor, so I get a yearly mammogram. Plus, I do check myself. I love the coffee and grace tshirt. I can’t imagine my life without coffee! I posted on Shredded Pork tacos…yum! I want to stay healthy so I make sure I attend all annual appointments for preventative care! As a man, I can’t pledge…but I do pledge to encourage the women in my life. I am a 2x breast cancer survivor who has had screenings done annually. I have my yearly mammograms in October. I feel that it’s important to myself and my children. I pledge to do monthly and yearly exams because my sister is a breast cancer survivor. I pledge to do monthly self-exams as well as my yearly exams because I know it can save my life. I always do the monthly check. I do monthly exams and annual exams because my om has had breast cancer and it runs in both of my parents side of the family. I pledge to do monthly self-exams as well as my yearly exams because my grandma had breast cancer & I know how important it is! I pledge to do monthly exams my annual exam is always scheduled the day after my birthday so I never forget. A friend has breast cancer I know what the devastation can be. I would give this hat to her. I do my screenings to be able to take faster measures if I ever do become ill. Early detection is so important. I had an emergency mammogram three years ago. I tell all nervous friends that it’s not bad at all. I commented on Cranberry Brie Bites! Looks interesting! I pledge I will do monthly exams my annual exam is always scheduled the day after my birthday so I never forget. A friend has breast cancer I know what the devastation can be. I pledge to do monthly checks and have an annual mammogram or as many as my Dr says to do. I have friends who have had breast cancer and know how important early detection is. I get my yearly mammograms in memory of my late grandmother and late aunt who passed away of breast cancer. I like the cross leggings. I do my own self-checks. I pledge to do monthly exams my annual exam is always scheduled the day after my birthday so I never forget. A friend has breast cancer I know what the devastation can be. Breast cancer is so easy to miss, it is good to do aa monthly. I like the Khaki Hooded Sweater! I do my monthly screenings because my grandma, my mother, and now my 37 year old cousin all had breast cancer. I get screened every year and do my own checks in between. I like the Cozy Card in charcoal. It looks comfortable and warm. I commented on Baked Parmesan Pesto Chicken recipe post. I love the coffee and grace tee shirt! Yes, I pledge to do monthly exams and my annual exam is always scheduled around my birthday to help me remember. I do my screenings for my granddaughters. I get my screening religiously every year. I believe you can’t take care of anyone else unless you take care of yourself. I pledge to do monthly exams my annual exam is always scheduled the day after my birthday so I never forget. A friend has breast cancer I know what the devastation can be. I do annual screenings as a preventative measure. So important to maintain healthy living! I like the Around the campfire Plaid shirt. My teen would want one too! ive never really needed a why, it just makes good sense! I do them because early detection is key to survival. Yes I pledge to do monthly exams my annual exam is always the day after my birthday so I never forget. I like the Not Perfect Just Forgiven Tee. I am now 41 so this year is my first mammogram. I do screenings so I know I have good health. I’ve never felt so strong on early screenings since I have have to go through a double mastectomy for a 13 inch tumor that if I would of went would had caught much earlier and would had saved me from chemotherapy. My last chemo will be on Dec 6th 2016 and I can’t wait to ring the bell. I am sorry you had to go through this but glad that your last chemo will on Dec 6th. I pledge to do screenings and self-checks because my mother is a survivor. I pledge to do monthly exams my annual exam is always scheduled the day after my birthday so I never forget. I like the because Jesus tee! I do my screenings because I want to always make sure I’m in good health. I do every year, make sure I visit my dr and get those exams, Everyone please take it serious! don’t think it can’t happen to you because it does.. I pledge to continue to have annual medical screenings, which I already do. I do screenings because cancer is prevalent in my family, including my two grandmothers. Love infinity poncho sweater!! It’s so pretty! Breast cancer runs in the family I would not go without my screenings ad I’d be endangering my health. I screen to be safe! I do my screenings because they are doctor recommended and breast cancer runs in my family! Taking care of myself is important so that I can always be here for my daughters, husband, family and friends. Thanks for this awesome and stylish giveaway and for showing your support for this cause! Yes I pledge to do monthly exams my annual exam is always scheduled the day after my birthday so I never forget. I do it because my friend is a breast cancer survivor and it made me realize how important it is. Breast cancer runs in my family. Every woman for at least three generations on my mom’s side have had breast cancer, so it’s important to get screenings. I have a mammogram once every 2 years and do regular exams as I am getting older and have to be very careful. I do regular screenings because I have many friends who have had breast cancer and my mom is a breast cancer survivor. I do screenings because I lost 2 aunts to breast cancer. Monday, I posted on 13+ Tasty Halloween Treats & Sweets. Some great ideas! I love the Side with Me Tunic in mustard. The pockets on the side are so cool! I do have to be honest here, I remember to do a screening of myself like every other month when I do remember to do them. But I did just get checked by a doctor recently. I do my screenings because I want to remain healthy for my family. I do screenings to stay healthy for my children. I’m just at the age where I need to start getting checks. Haven’t yet but need to make that appointment. This is an amazing beanie. I’d love one for myself! I ALWAYS go to my annual appointments, including mammograms. My monthly checks…I try…hubby has it set up as a reminder so he tells me the first of each month! I do my screening because I want to live long and set and example to my kids and I just had an aunt lose her battle with breast cancer! I do check ups and screenings so I can live a full healthy life and be there for my family and friends. Yep – I always check, especially after a girlfriend of mine (only 35) found a lump last year! Mine is always scheduled the day before my birthday every single year. And yes I do monthly exams. I have friends who have had breast cancer.